Wednesday marks the beginning of Kubica's grand reentry into Formula One. Robert Kubica may not have been on track for Tuesday's midseason Formula One test, but that doesn't mean his fans weren't there to build his confidence for tomorrow, with multiple supportive banners appearing along the pit straight. 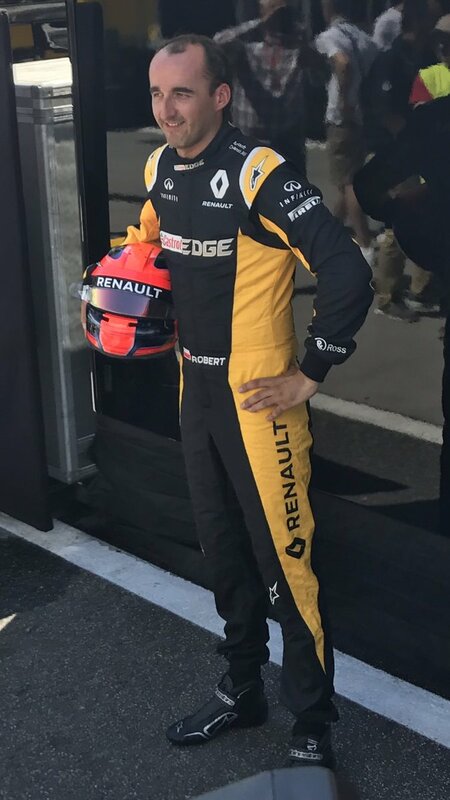 Standing in a race me like one of your French cars pose, Kubica showed off his Renault overalls, complete with his own name embroidered across the waist. He also debuted his new helmet design, featuring a stylized rendition of the flag of his home country of Poland. Tuesday served as little more than a day for Kubica to look pretty for photos, but the Polishman is nevertheless steeling himself for tomorrow's drive. According to a tweet by F1talks.pl, Monday saw Kubica perform the timed self-extrication test in front of FIA officials, a standard test which all drivers must go through. It involves removing the harness and steering wheel before pulling oneself out of the cockpit in under five seconds. In spite of ongoing concerns regarding Kubica's physical limitations, he passed the preliminary test. While hubbub surrounds Kubica's test Wednesday, both Robert Kubica and Cyril Abiteboul of Renault Sport F1 have de-emphasized the importance of tomorrow's results. Back in July, Abiteboul stated that lap times are not the sole factor in whether or not Kubica gets a race seat next year, citing a need for additional medical and simulator checkups to be done before he can return the Pole to racing at the highest level of motorsport. Tuesday, Kubica confirmed in a press conference that his actual pace is less important than how well he feels his body responds to the stresses of driving a modern Formula One car. The current set of design regulations mean that Formula One cars are pulling more intense lateral G-forces than any other year in recent history, which could pose a challenge for Kubica's crippled right arm. We have little reason to be nervous, though. If Robert could handle the E20 on track, and was faster than Nico Hülkenberg in Renault Sport F1's simulator, there is little reason to doubt his capabilities. 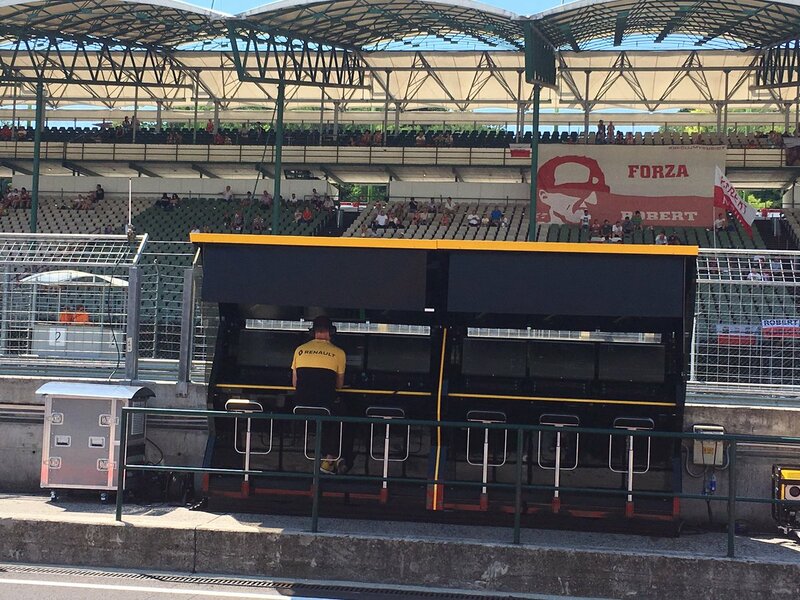 If Kubica beats the best R.S.17 lap time from the Hungarian Grand Prix last Sunday, a 1:21.589 set by Jolyon Palmer on lap 68, it will be time for champagne. It'd be a more exciting event than the Hungarian Grand Prix was, that's for sure. Excited speculators can chill. But that doesn't mean it's not happening eventually. This is the Polishman's warmup for his big shot later this month in Hungary. Dirty driving resulted in a nasty exchange between the two during post-race interviews. Haas F1 Driver Kevin Magnussen Upset That Hamilton is "Always In The Way"
This is the second complaint about Hamilton coming from the American team.